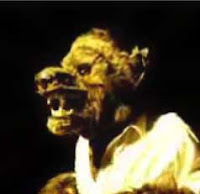 When I was twelve years old I wanted to grow up to be a make-up artist for monster movies. I experimented with fake wounds using Jell-o as a base. I tricked the two six year old girls down the block into believing that I had been disfigured by a terrible kitchen accident. In reality, I probably just looked like an odd boy with tasty gelatin on his face. That in its self could be scary to a young child. I scoured our little neighborhood library for clues on how the experts made fake wounds and Frankenstein masks. I bought a special issue of Monster Magazine that recommended liquid latex and other exotic items. I even sent away for a catalogue of theatrical supplies to see if I could buy any of the needed ingredients. Our hardware store didn't carry any latex, facial modeling wax or movie blood. I found out liquid latex was going to cost me $40 a gallon and fake blood $10 a jar. A weekly allowance of $2 was a great week back then for me. My dreams of being the Colorado master of horror faded. This Halloween, I want to remember that young boy who loved those B-movie monsters. 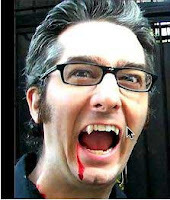 He would have given a summers worth of allowance to be able to create a pair of fangs like the ones demonstrated here by Bre Pettis and Eric Skiff of Make magazine. Bre and Eric, fangs for the memories! It's a Commmon Craft video. How could I not link to this video? I have a friend who every year made a scrapbook of the previous years events and presented it to her sweetheart for Christmas. She had a great time picking out the photos and graphics, making up clever titles and putting it all together. Over time the two of them had a series of scrapbooks that they both treasured. An article in VideoMaker, The Craft of Family History Videos: Making Classics Out of Clutter, got me to thinking about my friends scrapbooks and how this kind of project doesn't have to be made out of only photos. It could be a video compilation, as described in the article. It could be a web page that had bits and pieces of different media. This could be modified into a super lesson plan for a video class. Last year, I had a young lady create a web site about a trip she had taken to Japan. Her family made the journey in the middle of the semester and when she came to talk to me about how she could make up the work for the web class, we came up with this idea . She took photos and kept a journal during her trip that became the core her site. It was one of my favorite projects from that semester. I built a cardboard periscope when I was in grade school. I then shimmied on my belly into the front room to look at my sister from behind the couch as she watched TV. I felt so sneaky and sly. She said she knew I was there all the time. In junior high I saw a pair of special glasses with mirrors glued near the arms that would let you look behind you. I loved this idea and ruined several mirrors trying to make one small enough that could be glued onto my frames. My mother put an end to the whole project once she realized I was going to glue broken pieces of glass on my new spectacles. "Those frames cost too much. You'll ruin them....and you'll cut your eye out!" Mothers are always so concerned that we will poke, cut, punch or shoot our eyes out. My mother was responsible for squelching a promising career in optics. So the child in me was excited to see this periscope that David Bynoe built in his backyard. It is twenty feet tall and allows him to look over his fence. Cool. 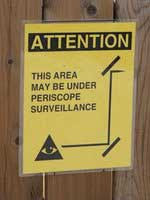 Kind of creepy from a neighbor's standpoint. But still, cool. I had two students try to build something similar that would allow us look out of my classroom and down to the main hall where we could watch the Principal's office. It never quite worked because I wouldn't let them attach the mirrors with glue or screws to the school's walls and ceilings. They couldn't get them to be steady enough with just tape and blamed me for the failure. I accepted the blame but kept the friendship of our building custodian. 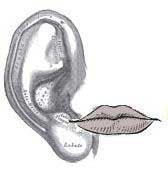 I suppose, much as my mother accepted the blame for my failed attempts at optics but relished her continued good standing with the family opthamologist. I'm pretty sure David Bynoe had a more supportive mother and a nicer tech teacher. 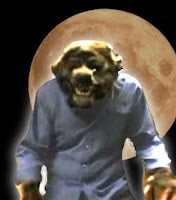 I’ve posted several videos of a werewolf costume created by a grad student at Western Washington University. I wrote her with some questions about her project. She was more than generous with her answers and I wanted to share some of her responses over the next couple of days. The comments at the end are mine and reflect my own bias. If you want to read her complete, un-edited comments, they are posted here. Did you do all the work yourself or was this a group project? If so, how many were involved? "For the werewolf costume that is on the YouTube website I worked with my partner in crime, Ben. Ben is a mathematician who's hobby is audio engineering. 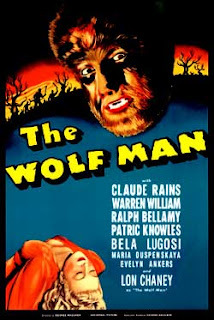 We worked together on the stilts and the body of the werewolf. However, other people helped out. At the hardware store the staff there cut the wood we used for us, folks who saw our videos sent us ideas or comments that used to improve the design as we finished them up. Any big project will involve more people than those who work on it directly." Collaboration and over the web no less. It excites me to see things we've been talking about for years actually being done. Getting feedback from someone (a stranger) online. How can we help our students with this new way of working together? Or maybe, how do we get out of their way and let them work this way? In the middle school technology lab I facilitated, we used to have a station with a FischerTec building set. For those of you who have never seen these kits, it is kind of like Lego on steroids. I am told that it is often used by engineers to prototype mechanical designs. Whiny Student: "Mr. G, all this stuff is too easy. I've been building things since I was two." Wise Old Tech Teacher: "OK. Build a working hand." Whiny Student: "No problem! I'll have it done by the end of the hour." I'd come back the next day and usually they were stuck and would say, "This is harder than it sounds." They would have a jointed hand but couldn't make it grip. We'd talk about how a human hand works and maybe look at a few pictures. Wise Old Tech Teacher: "Try again. Only this time, just make a working finger." I had kids come after school to spend extra time on that assignment. A few came close. A couple of young men got a finger they could control with a motor but weren't able to get a whole hand built. I saw this video the other day and thought if this had been available for my kids, they would have solved "the finger challenge" in no time. The walls of my classroom would have disappeared and my students could have built off what others had already done. 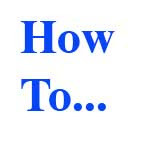 Written instructions and diagrams can be found here. How did you come up with the stilt idea? "We wanted our werewolf costume to look like it had wolf legs, and we wanted to build those legs out of inexpensive materials without creating a lot of waste. Many movies and television shows use effects to achieve this look, sometimes they use padding and create the illusion of a very long foot walking on short toes, or they will create extensions of the leg (stilts.) We spent about forty minutes researching what had already been done. However, the stilts we found video and photographs of are not easy to remake, nor can you stand still while using them. They also required using materials, chemicals or molding techniques not available to most people." We went to the hardware store with a rough sketch of what needed to be a part of the stilt, and chose our materials based on what was available. The staff at the store cut the wood for us, but we didn't buy everything we knew we needed. We went to a used hardware store afterward and bought old furniture foam, drawer slides, and door hinges. That way a portion of our stilts would be made of reused material. Learning to re-use material can help stretch a budget and prevent waste of materials." I want to hand this response to my kids who are working on special projects. The research, the planning, the winging it at the hardware store and the re-use of materials. It makes my old teacher heart throb with pride and they aren’t even my students. I am using it to improve my Scottish accent for when I don my kilt and walk around the house telling stories of the founder of clan Gunn, Olaf the Black. What advice would you have for middle schoolers/high school students? "Look to a variety of resources: Books, magazines, websites, TV specials, and anyone locally who already does what you want to do. But, look critically at your resources. A website may have a perfect how-to guide with excellent results but be selling the products they use in the demonstration videos. Will the authors of that website show you better alternatives to their products? Probably not, they want you to buy their products. A TV show won't be very technical, so you will have to fill in the blanks and try to figure out what steps are not being shown to make the process appear “pretty” on TV. Older books may focus on traditional materials without ever mentioning the new tools available. For example, there was a special wax used for mask making in the 1960's called Negacol, that no longer exists. Books from that time would make you think you needed to use wax when the product used today is actually made from seaweed and is very different! You may want to avoid the how-to videos produced for professionals since they will use special materials and complicated techniques that can overwhelm and empty the pockets of the beginner. Once you have a grasp on what you're doing, the professional videos can be pretty cool, though. Also, just because someone's expert at a skill doesn't mean they're not a little crazy. So if you meet someone at a comic book convention or on the internet who is willing to help you out with a project, keep your parents around when you talk to them face to face and don't hand out your address, mom's credit card number, wads of money, a copy of your birth certificate, cherished family heirlooms, etc." Look critically at your resources. Isn’t that turning out to be one of our major tasks as educators as turn out this next generation into the world? Access is getting easier and easier. When the affordable laptops hit the market next year via the One laptop per child project, access will be even broader. The important skill is determining if a web site is reliable and pertinent. The important skill is helping our kids to look at resources critically. The important skill is teaching our kids to use the internet as a tool. "I've never had a boy teacher before." He was elated to be referred to as a boy. I told him that the kids may be referring to him as a boy, but all those young teachers are already referring to him as "gramps." Some days he hates me. I said I'd keep my eye out for age appropriate web sites and I almost immediately stumbled on this site, Build Your Wild Self, put up by the The New York Zoos and Aquarium. 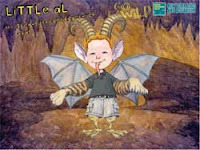 It's based on Maurice Sendak's book, Where the Wild Things Are. First you create a picture of yourself. Gray hair was not an option here so I had to settle for a nice golden brown. Then you add various animal parts until you get the right amount of "wild" in your picture. It was easy to use. The interface was clearly laid out and it was fun to play with the various options. The origin of each animal part is also described. The tongue in my picture is an "Anaconda snake tongue." I could envision using this activity as a jumping off point to talk about the animals used in constructing a wild thing. My only problem was getting the finished picture off the web site. I was able to send an email to myself (and Chuck). I could create a desktop for my computer. I couldn't simply save a copy of the picture. This may be an issue with Firefox as I didn't try it in a different browser. I was able to do a screen capture but that might be a little advanced for younger kids. It's a minor complaint and wouldn't stop me from recommending it. Good Luck Chuck. Those kids are lucky to have a great "boy" teacher like you! 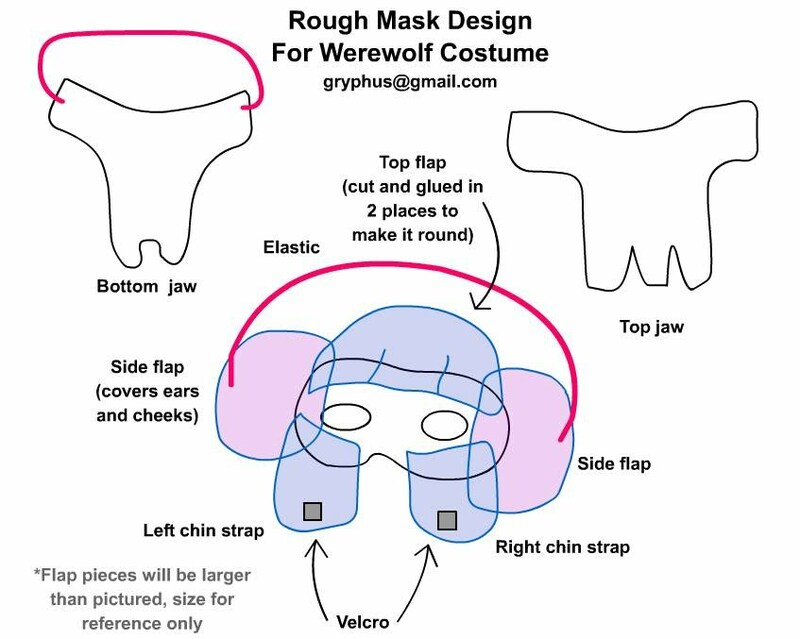 Here is the final video of the werewolf costume design/creation I've been following on YouTube. I have been so enamored of this project that I put together some questions and sent them off to the designer. Turns out she is a grad student at Western Washington University studying Environmental Education and was more than generous in responding to my inquiry. Her letter has been a source of discussion amongst my circle of colleagues and students and I wanted to share it with everybody. Because of length, I've broken her email up into shorter posts that I can spread out through the week. If you want to read her entire response here is a link. 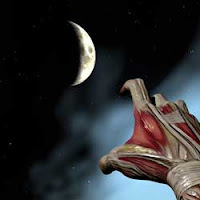 A link to all the videos of the werewolf project can be found on YouTube. But first the video of the final finished costume. I love how he looks in the parking lot. I can only imagine the neighbors taking little Fifi out to do her doggy business in the front yard and in the dim light seeing a werewolf lumbering through the parking lot. I wonder if they remembered to bring Fifi in before locking the door? I wonder if there were any strange 911 calls that night? How did you learn to do this? Self taught or did someone show you the basics? "I learned to sew in Home Economics class in middle school, and when I went to college I took a college course in costume construction and made costume parts for plays and for fun. However, I paid attention and stayed after class to read through the books and magazines that were in the classroom. I also took up the teacher's offer when she suggested extra projects to do in our spare time. By becoming very knowledgeable in the single skill of sewing I found I could apply sewing techniques to many, many, other things. For example, to make a clothing item called a corset one has to cut and grind metal strips then use acrylic (a plastic) to cover up the sharp metal edges. Sewing introduced me to metal work and making objects using plastics. Sewing is also a great introduction to some of the fundamental concepts in higher math, such as topology, multivariable calculus, analytical geometry. It's very easy for a student to think of curves and folds in order to answer a test question when they've been curving and folding fabric." 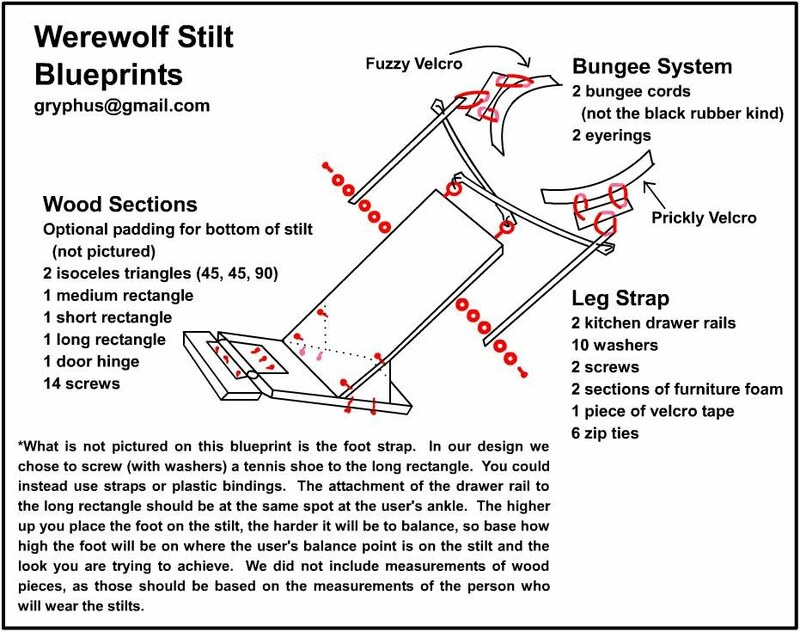 I had a post on Monday about werewolf stilts. The same person is still at it and has created a head to go along with the stilts. She gives a step-by-step description of how she created a mask that moves with the wearers jaws. I was discussing this with another tech teacher over coffee. 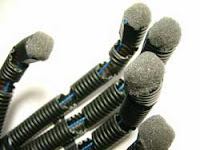 In our lab we used to challenge kids to create an articulated head that was run with pneumatics. They were doing this pretty much from scratch or building off of what other students had figured out. If the kids had been able to access videos like this one, the quality of their work would have increased immensely. I wonder how many of us are taking advantage of what the web has to offer? How many of us are still running our classrooms like the web doesn't exist? These kids are going out into a world where the web is going to be a part of their professions. Anyway, take a look at this mask and the plans are at this site. 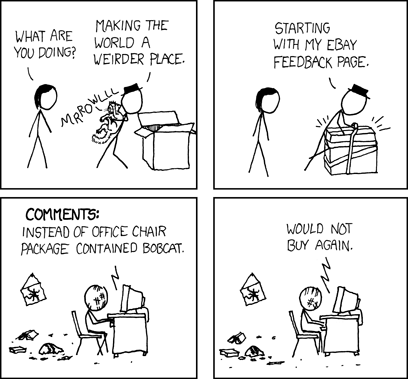 I was reminded of this trick while browsing Lifehacker. You can limit your search results in Google to show only educational (.edu) sites. 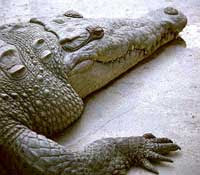 I did this and discovered this cool gallery of crocodile photos sponsored by the University of Florida that are free for educational or non-profit use. That's where this neat picture was hiding. It may come back to haunt you! "Finally you are dead. You dastardly piece of what is evil in the world. Good riddance!" "Shoot the head. You dufus! Shoot the head!" He doesn't listen to us, he never listens to us. Before he is even out of the building the little bits and pieces of dead creature pull themselves together and reform into the same monster. Now a little angry at having been blown to bits. He hunts the hero down and they begin their dance of over acted pain and cinematic explosion until the end of the movie where someone finally shoots the head! Walking out of the movie we are thankful we don't have to deal with creatures that can pull themselves back together again. A world where the broken stay broken! Not so any more! Watch the following movie and tonight you will add locks to your bedroom door and lament the loss of the comfortable world in which you grew up! Raffaello D'Andrea, is one of the creators of this chair of doom. He doesn't seem like an evil genius and I enjoyed reading about his other projects. He is an associate professor at that empire building, bent on controlling the world organization, Cornell University. 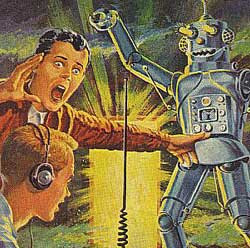 BotJunkie has become my daily dose of cool robotic stuff. Thanks for making me aware of my impending doom and other neat stuff. I always had this idea in the back of my mind of running a class or after school club designed around creating a monster movie. It's one way of getting students to bring together a wide variety of technology skills: animation, video, sound, engineering , design, modeling, and mechanics. As a bonus we could also work on some of those other school subjects like writing, editing and reading. Much of the time kids don't see the value of something until they actually use it. A big movie project would have them begging me to learn and experiment with knowledge. I love it when students pester me for information. It makes me feel like a teacher. "We need a monster with 6 foot arms. Who's going to build this ugly thing?" "We need a space ship that flies into an asteroid and explodes. Who's wants to animate that?" "I want a realistic dinosaur roar. Who's going to come in during lunch to work on that?" "We need a model of scary house that we can blow up later. Who wants to create this?" I know I'd have 2-3 kids who would volunteer for each of those projects. So many possibilities. So much learning. The following video got me to thinking about my "monster movie" idea again. Here is a link to the plans. I love this blender. It is at the top of my Christmas wish list! Second on my list is a new iPod...preferably not this one. Fell into this site while searching for something else. I love that about the web! Here are the winners of the Science and Engineering Visualization Challenge. 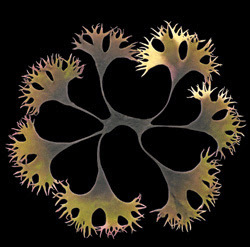 The picture shown here is a photograph of Irish moss taken by Andrea Ottesen. I selected this image because it was taken with a 7-megapixel point and shoot camera. Felice Frankel, one of the judges, is quoted in the article saying, "We shouldn't forget that we don't need [complex equipment and techniques] to create beautiful representations." During a dinner conversation recently, the inner workings of the cell came up and I raved for a brief minute or two about this great video I had seen on TED. 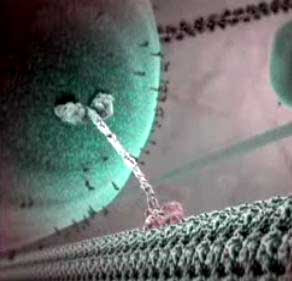 A graphic illustrator had created a video of all the little nano-machines that are bustling around inside every cell. I wished this guy had illustrated my high school biology textbook. Promising I would look up the link for my dinner guest and send her the link, I thought why not throw it on my blog too. The illustrator's name is David Bolinsky and his talk at TED is "Fantastic voyage inside a cell". Here is the Harvard site he references in his talk which gives a bit more information about the project. If you want to watch any of the clips here, you will need to launch their video player from the front page. To see some of the other illustrations he has been involved with you might also take a look at Bolinsky's company site, XVIVO. If you haven't wandered around the TED site yet, what are you waiting for? 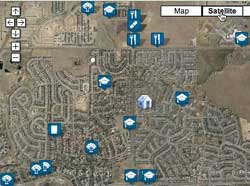 My friends and I have been playing around with this neat little web site that determines a "walk score" for your home. Enter in your address and it will create a map centered around your house. All the amenities you can walk to are shown as little icons, such as restaurants, schools, coffee shops and parks. It is an interesting filter to use in studying where you live. I already knew my score was going to be low as I've been complaining about the walk-ability of my neighborhood since I moved here. Now I have a little map and a score of 29 (out of a 100) to show that it's just not my imagination. If I wanted easy access to schools, I would be living in the right place. If I wanted music and entertainment. Not so much. This could be a jumping off point for a geography class in talking about place. A science class talking about environmental neighborhood design. A husband talking about moving someplace where I, ...er he, can walk to get a cup of coffee! 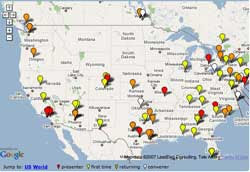 I visited the K12Online07 conference site this morning with the plan to watch the keynote. Looking at the time though, I remembered an appointment in 20 minutes. I will postpone watching until I get back. I did have time to wander around the page set up for first timers and saw that they had an Attender map for all the participants. I signed up and my little dot is now floating there in the middle of Colorado. I've scoped out where the bathrooms and snack bar are all located and I am ready to go. Everything is so convenient. My students, and their older, slightly befuddled teacher, always used to forget something when venturing out into the world, or the hallways, to shoot video. 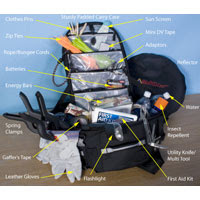 Through trial and error we created a "kit bag" that had useful items that made life easier in the field. It saved us lots of trips back to the classroom. Videomaker has an online article, "Alakazam! The Magic Gear Bag of Tricks" that addresses this same issue. They are much wiser than I and have included several items that never occurred to me. Although, as a teacher, I don't know that I would ever send any of my students out of my sight with a butane soldering iron. I'm not even sure what I would do with a butane soldering iron? If you've never seen Videomaker magazine take a peek. On the front page of their website they have an offer for a free issue. My middle school kids found the articles a little beyond them. My high school kids were more interested and would read the issues I left laying around. I eventually asked our library to subscribe. "The conference theme is “Playing with Boundaries”. The 2007 conference begins with a pre-conference keynote the week of October 8, 2007. The following two weeks, October 15-19 and October 22-26, forty presentations will be posted online to the conference blog for participants to download and view. Live Events in the form of three “Fireside Chats” and a culminating “When Night Falls” event will be announced." Several years ago I did a presentation for the technology support group in my school district on how to create a personal blog using Google's Blogger. Many of us were excited on how this tool could be used in education and wanted to get it into teacher's hands. On that same day, the district coordinators passed out a book, The World is Flat, to use as a discussion starter at our monthly meetings for the rest of the year. Since we were learning about Blogs, I volunteered to create one where we could share our thoughts on the book in between our meetings. It was a success in that everyone had a chance to post and comment on a working blog. It was a worthwhile experience and I learned a lot as the moderator. "I don't know how to do it"
"Seems like it will take too much time." I think it is a valuable tool and want to offer a few resources today that may encourage you to explore it's use in your classroom. First, there are many possibilities available to you in creating a blog. I like and use Blogger because it is easy to setup and maintain. There are other options though and here is a partial listing of some of the blogging programs available. My district started using Gaggle this year for student email and if you have access to that program, it has a new blogging feature. Second, I wanted to gather some sites together with suggestions on what to do with your blog once you have it up and running. Edublog has an article on "10 Ways to Use Your Edublog"
Distributed Teaching and Learning. Nice explanation of the idea of "scribe posts". Daily class notes that are posted each day by the students. “Let’s see if I can start a log…” Long post by Will Richardson who writes about his experience setting up classroom blogs since 2001. Blogging 101: Web Logs go to school: Article on CNET about blogging in education. Anne Davis, from Georgia Stage University, writes about Rationale for Educational Blogging. She is one of this year's presenters at K12 Online Conference and will be giving a related presentation: Learn to Blog: Blog to Learn. Third, here is a sampling of classroom blogs I found online. I'm not the first to promote blogging to teachers and there is a plethora of information on the internet. I gathered and reviewed all this information in an evenings time. Every time I go back to the web to check something out for this post, I find another item I want to include. For example, I found this site that lists resources and examples for potential bloggers. Pick a program. Start small. Give it a try. Why not just One BIG Picture? "Why don't we just design web pages in Photoshop and then load the picture as the whole page. It would look so much better!" "What about slicing the image up Mr. G? Huh! What about that? The files would be smaller!" Requires tables to hold sliced images. Hard to manage and update. And a biggie....not search engine friendly. I am so much smarter if I get one or two months to think about my answers. I wonder why my students never understood how clever I am? Mischook, Stefan. "PSD to Web Page." Killersites.com Blog. 20 Sep 2007. Killersites.com. 22 Sep 2007 . Common Craft has done it again. They created a video about why fluorescent bulbs are better. A better value. A better choice for the environment. These folks are so clever. 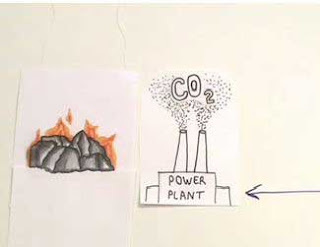 One example of their skill is how they show the volume of coal being burnt. It's implied through the size of the paper flame. The bigger the flame, the more coal being consumed. If I did this, I might have made the pile of coal bigger. I may have made a chart depicting use over time. I may not have even done anything to graphically show what was happening and droned on in my monotone teacher voice while the kids looked at a lump of coal. "Yes children, the more electricity used, the more coal we have to burn. Any questions? Any questions?" This is why I am sitting home alone writing poetry about garden snails and the folks at Common Craft will soon own the world. Good content. Clear delivery. Fun to watch. Where were they when I was learning Economics?